Bradman Oval part of World Record! | The International Cricket Hall of Fame. Home » What's on » Bradman Oval part of World Record! Bradman Oval part of World Record! The Bradman Oval is the site of an official world record! In early May over two thousand people assembled on the Bradman Oval, put up their umbrella’s and created an enormous Mary Poppins in an attempt to break the world record for the largest umbrella mosaic. 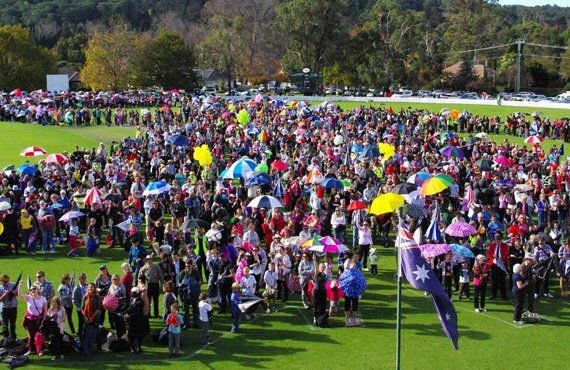 The largest umbrella mosaic consisted of 2,115 participants and was achieved by the Southern Highlands Youth Arts Council Inc. (Australia), at Bradman Oval Bowral, in New South Wales, Australia, on 7 May 2011. To celebrate the Southern Highlands Youth Arts Council (SHYAC) has created an official souvenir poster which is available for sale. SHYAC is working hard to have Bowral recognised as the birthplace of Mary Poppins. PL Travers, the author of Mary Poppins was living in Holly Street Bowral with her family when she created her magical nanny while telling her sisters bed time stories.